SYDNEY, AUSTRALIA, October 14th 2017, In celebration of World Squash Day, The East Coast Squash Academy is excited to release the most all-inclusive infographic of squash statistics representing the history of squash, its massive global appeal, fun facts and interesting trivia.The Squash Statistics Infographic compresses 187 years of the sport’s history into exciting bite-size morsels of highlights outlining the benefits of squash, statistical and historical data from around the world, celebrating both male and female squash players. “Squash is one of the world’s most misunderstood sports and our goal releasing this visually exciting infographic is to encourage more people to experience the fun, excitement and health benefits of the game,’ explains Aaron Frankcomb, The Academy’s founding director and head squash professional. “Worldwide, squash is played by over 20 million people with Australia leading the world with nine gold medals making it the most successful squash nation in Commonwealth Games history. Squash welcomes people of all ages and social groups, it is not just for celebrities and high rollers.” Mr Frankcomb said. “I don’t know of another sport that challenges your physical ability, technical skill and reflexes as well as combine strategic intent imagination and mental strength and toughness like squash does.” declares Peak Performance Strategist and faculty member, Dr Marc Dussault. The infographic was created for public distribution to expand the sport’s reach and exposure, please feel free to share it on social media with a backlink to the Academy’s website where more than 100 original references are listed. Founded in 2011 when Aaron Frankcomb retired from the Professional Squash Tour, the East Coast Squash Academy set out to create a business model to expand the presence of squash within local communities surrounding squash centres. The first installation was at Willoughby Squash Club where Frankcomb was the club’s resident squash pro until early 2017. The Academy has been home base to two full time senior players that have reached careers highs of top 240 in the world on the Men’s PSA Tour. Its best female professional reached a top world ranking of 130. The junior program has boasted (pun intended) over 500 children participating in weekly squads and training sessions. Memberships and participation in squads increased by 100% and 300% respectively and tournament registrations reached at an all-time high. Aaron Frankcomb was ranked in the top 100 professional squash players for 8 years, 4 years in the top 50, winning 3 PSA titles. He represented Australia at the 2010 Commonwealth Games, was a Junior Champion in all age groups including 2 times in the Under 19 category and holder of scholarships in the Tasmanian and Australian Institutes Of Sport. He now coaches professionally and remains Sydney’s top ranked squash player and is still considered within the top 5 players in Australia. Marc is the Academy’s Peak Performance Strategist and an avid squash enthusiast (addict). In his mid 40s, he reached the top ranks of squash masters with less than 5 years of competition using his signature techniques of deliberate practice. When not on court coaching or doing high intensity drills and routines, Marc is the Exponential Growth Strategist mentoring business owners and entrepreneurs who seek to become champions in business. Published on July 13, 2015 in Australian News, Events and News. 1 Comment Tags: Australian Women Squash Camp, Female Squash Events, Ladies Squash, Ladies Squash Camp, Squash Training For Women. Sydney, 13 July 2015: Squash a gentleman’s sport? Not anymore. The East Coast Squash Academy based in Sydney, NSW is changing the face of squash with the announcement of Australia’s first All Women’s Squash Camp created for women by women. The idea for an all-female camp came from other sports that used this approach as an introduction to their sport – so why not consider it for squash? All-girls or all-women squash camps have been run successfully overseas, but never in Australia – UNTIL NOW. The camp will feature an impressive all-female faculty, including current World #31 (and former World #13) Donna Urquhart, East Coast Squash Academy Assistant Professional Moana Gray (former World #131), and top USA College Player Tiffany Hau. As its name suggests, this Women’s Squash Camp is exclusive to female players and structured to accommodate first-timers to the sport as well as competitive players. Senior and masters players are expected to be the majority of participants with the encouragement of mother-daughter registrations. Don’t for a second think this is not a serious squash camp! Participants will be on court for more than 12 hours and will also be privy to two hours of sports psychology training by the Academy’s mental toughness coach and resident faculty member, Dr. Marc Dussault. Dr Dussault’s keynote presentation “How to avoid mental mistakes to instantly improve your squash game” has been a game changer for players across Australia and Canada. The mental aspect of the game is one of the four pillars reinforced by the Academy, along with technical, physical, and strategic development. The camp will run the weekend of Saturday and Sunday August 22nd-23rd at Willoughby Squash Club (443 Willoughby Road, Willoughby NSW 2068). Included in the registration fee is all the equipment needed as well as two catered meals and healthy snacks throughout the weekend. Expected to be scheduled only once a year, this is the ideal opportunity for girls and women to step into the world of squash. The inaugural pricing (early bird pricing is A$495) has been set to entice newcomers to the sport. Founded 4 years ago by Aaron Frankcomb, the East Coast Squash Academy is based out of Sydney, NSW. And now operates in two locations, the Willoughby Squash Club and the Bondi Waverley Squash Club. The Academy works with players of all levels, from social players to high performance players on the PSA tour providing opportunities for juniors to masters players to be coached and compete at their level of proficiency. This year, the Academy had 22 juniors ranked on the New South Wales Junior Rankings, two at number one in their divisions. Donna Urquhart (Yamba, NSW) is current World #31 and former World #13. She has won 8 titles while on the tour. In addition, she has represented Australia at the Commonwealth Games, earning a bronze medal. As a junior, she won 5 titles and came runner-up at both the Scottish and British Junior Opens. Donna is still competing on the tour and will be playing on home soil at the Victoria Open and Australian Open before coming to Sydney to coach the Women’s Camp! Bondi Waverley is a member-run club located in the heart of Bondi Junction. A beautiful four-court centre and bar, Bondi Waverley Squash Club has entered teams in Sydney’s pennant competition for over 40 years. In addition to courts, the club is also available for functions with a spacious bar and lounge, with pool tables and poker machines. The club is now the second location for the East Coast Squash Academy and hosts annual tournaments as well as regular programs for all skill levels and age groups. Published on October 24, 2014 in Australian News and Events. 0 Comments Tags: Graffiti, Graffiti Costs, Graffiti Removal, Graffiti Removal Day NSW. I recently blogged about that Graffiti is a costly public nuisance that costs taxpayers a lot of money, not to mention kills taggers and graffiti vandals on a regular basis. Even though there are numerous graffiti removal companies, the problem still persists. 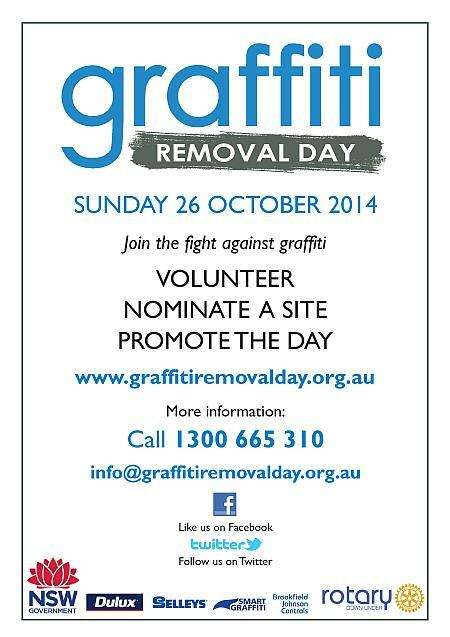 The NSW Graffiti Removal Day is this Sunday and its goal is to bring attention to this problem and reduce the graffiti that scars the beauty of our cities. Get out there this weekend and do your bit to help. If you’re not part of the solution, you’re part of the problem! Thanks to Amelia Priest of Just Snacks for sending the original notice through. She has done her bit to help as I have (getting the word out to more people), now it’s your turn! Published on October 10, 2014 in Australian News and Events. 1 Comment Tags: Australian Graffiti, Graffiti, Graffiti Costs, Graffiti Removal. Graffiti is a costly public nuisance that costs taxpayers a lot of money, not to mention kills taggers and graffiti vandals on a regular basis. Even though there are numerous graffiti removal companies, the problem still persists. A NSW organisation has created a Graffiti Removal Day to bring attention to this problem and reduce the graffiti that scars the beauty of our cities. Get out there and do your share to beautify our surroundings! Thank you to Amelia Priest of Just Snacks for sending this through. She has done her bit to help as I have (getting the word out to more people), now it’s your turn! We all need to do our share of keeping this beautiful country clean. Clean Up Australia Day is a great initiative that you should seriously consider participating in. Published on August 19, 2010 in Events, General and News. 0 Comments Tags: Donations, Help Fellow Australians. As you would expect, I get requests to donate to charities all the time. I prefer to keep my philanthropic and charitable contributions private and confidential, but every once in a while something strikes me as unique or different in the approach, strategy or tactic used. Today’s post is a case in point. Dr Cary Fraser, a Sydney Eastern Suburb dentist with a dental practice based in Double Bay is going to squeeze into his cycling shorts and go the full 90 Kms… on the Sydney To The Gong Bike Ride — But that’s not what caught me eye. Published on August 1, 2010 in Events and News. 2 Comments Tags: Engineering Education Australia, Engineering Week 2010, Make It So. Anyway, I thought I would remind you of it since Engineering Education Australia has an engineer’s blog for Australian Engineers amongst a wide variety of services. I like their slogan “Make it so” – a tribute to Star Trek and the fact that engineers “make it so“. Click on a hyperlink and have a look around – I’m sure there must be something of interest if you’re an engineering or construction professional or technician OR if you have a son or daughter who one day aspires to join the engineering profession! The ENCORE is in Sydney This weekend! I deal only with REAL businesses who sell REAL products and services. Many of my clients don’t even have ONE Internet payment gateway yet they make THOUSANDS OF DOLLARS a month processing credit cards and getting Electronic Fund Transfers into their bank accounts. No hype, just REAL cash in the bank. If that’s what’s you want – come to the FINAL ENCORE presentation of The Exponential Extravaganza – it’s only taking place in Sydney and only THIS Saturday. Don’t get left behind. The Exponential Extravaganza Hits Brisbane This Weekend! Published on May 31, 2010 in Business Growth and Events. 0 Comments Tags: Exponential Extravaganza. The Exponential event of the year is coming to Brisbane this weekend… Saturday 5 June. Don’t miss it. Click on the hyperlink to book your seat now for the Exponential Extravaganza! As a reader and/or subscriber to this blog, you’ve been exposed to Exponential Blogging Strategies all year round – this blog is an Exponential Strategy in action, regrouping Australian Blogs in one place, increasing each blog’s ranking to get more readers and scubscribers. It’s a win-win proposition! So why not pop over to the Exponential Extravaganza this weekend in Brisbane or in a few weeks in Melbourne or Sydney? This is the ONLY FREE event of its kind this year. Published on June 22, 2009 in Branding, Business Growth, Events and News. 0 Comments Tags: 2009 Telstra Award, Business Woman Award, Telstra, Telstra 2009 Award, Telstra Award, Telstra Business Woman Of The Year Award, Telstra Entrepreneur Of The Year. Attention all Australian Women Business Women and Men who know outstanding women worthy of nomination… The 2009 Telstra Business Woman Of The Year Awards are on again… Click on the URL for important dates. This is an excellent way to get FREE publicity and see how you stack up in business. If you want to take a 20-minute self-administered ‘Business Marketing Autopsy‘ Click on the hyperlink for a quick profit check-up. Want To Make Money With Your Blog? Published on June 1, 2009 in Events. 0 Comments Tags: Bootcamp Preview, FREE Event, Make Money With Your Blog, Preview. Attend a 3-hour event in Sydney and Melbourne NEXT WEEK and discover how to make money with your blog, it’s FREE and totally E-X-P-O-N-E-N-T-I-A-L.
Make $100/Hour From Home… Sound Impossible? Published on May 10, 2009 in Business Growth, Events, Flipping Websites For Profit and Internet Strategies. 0 Comments Tags: Exponential Blogging, Exponential MasterMind, Flipping Websites For Profit, How To Make Money From Home, Make Money From Home, Make Money Online, Marc Dussault, Wealth Without Worries. If those two blog posts don’t convince you, then this isn’t for you. If you are even a little bit intrigued – attend the Investor Briefing – your head will be spinning with excitement. Want to know HOW to think like this? Check out this new updated site I just re-launched… Where you can Discover Your Own Exponential MasterMind Thinking! Published on April 2, 2009 in Events. 0 Comments Tags: Blog, Blog Portfolio, Blogging, Flipping Websites For Profit, Marc Dussault, Virtual Real Estate, Wealth Without Worries. Hmmm… Interesting concept – having MULTIPLE blogs, each with a different target audience to create a portfolio… What if there was a way to actually make money with it on auto-pilot? Guess what? There is. It’s called Virtual Real Estate and there is an event coming up in Sydney and Melbourne that will explain it all. Even though the title of the program is called Flipping Websites For Profit, the Wealth Without Worries Investor Briefing will explain that this concept works even better with blogs! Registrations have already started and the seats are filling up fast – as you’ll see on the events page – this is NOT a salesfest event. It’s an Investor Briefing with LIMITED ADMISSION into the program. Go check it out now. Who knows, you might just be the next Virtual Real Estate Mogul!